The Thermo Scientific Nicolet iS 50 Spectrometer is a commercial, compact, high-performance Fourier Transform IR spectrometer. In its base configuration it is designed for operation in the mid-infrared region (4000-400 1/cm). The device is equipped with three optical inputs, namely a He-Ne laser, a white light (Tungsten-Halogen near-IR) and the infrared source that are connected to the interferometer (linear-scan Vectra type). All three optical signals share the same beam splitter and mirrors. 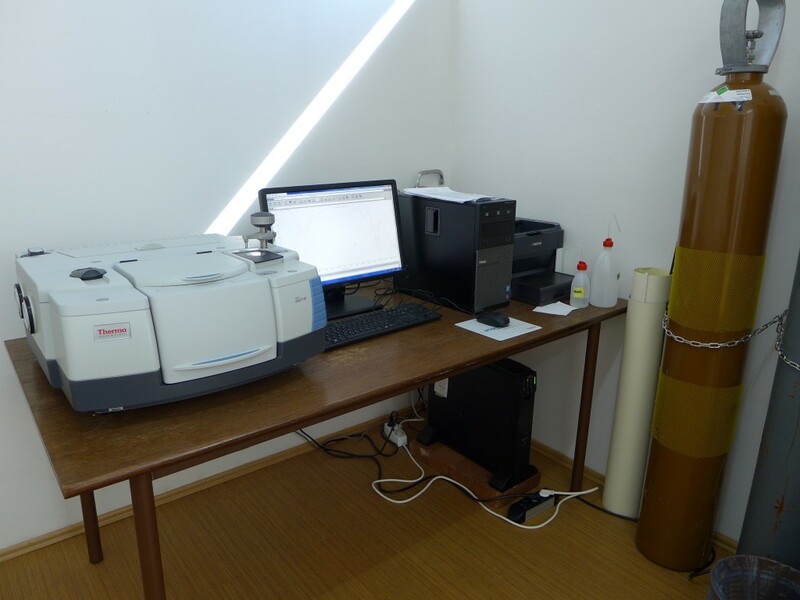 Except for transmission IR measurements of solid and liquid samples, it enables collecting IR spectra of powder, gel and thin film samples in reflection mode with built-in diamond Attenuated Total Reflectance (ATR) sampling technique which is quick, non-destructive and requires no sample preparation. The Nicolet iS50 spectrometer is highly flexible; it can be upgraded from its base configuration to a fully automated, multi-spectral range system that can acquire spectra from the far-infrared to visible. The OMNIC Software Suite provides quick and easy acquisition, processing, analyzing, and managing FT-IR data in a graphical environment. In our laboratory, FT-IR spectroscopy is mainly used for identification of surface organic species (for example various ligands used as capping agents) attached to magnetic nanoparticles, for optimization of their surface functionalization and for surface chemistry investigation of so-functionalized nanoparticles. Furthermore, qualitative and quantitative analysis of various specimens with mid-IR active vibrations can be performed.